Ancillary All Products - B&L Cremation Systems, Inc. 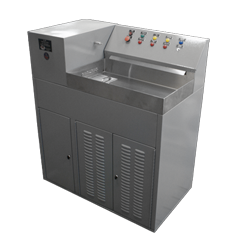 The BL 100 pet processor with built in loading tray is the industry’s state-of-the-art cremated remains processor. 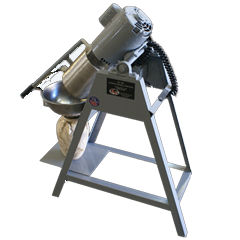 It is an advanced pulverization system that is quiet, dust free, and shuts off automatically. The remains are powdered in less than 30 seconds in the stainless steel drum. The pulverization is accomplished by a rapidly turning 1/4″ thick stainless steel blade driven by a 1 HP motor. A dust tight seal is provided on the drum lid to prevent any leakage. 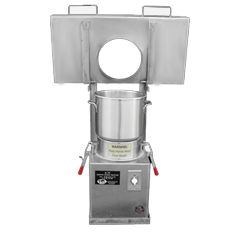 The New BL 199 with built in loading tray is the industry’s state-of-the-art cremated remains processor. It is an advanced pulverization system that is quiet, dust free, and shuts off automatically. The remains are powdered in less than 30 seconds in the stainless steel drum. The pulverization is accomplished by a rapidly turning 1/4″ thick stainless steel blade driven by a 1.5 HP motor. A dust tight seal is provided on the drum lid to prevent any leakage. The BL 499 is a fully automatic dust control processing center. This processor comes fully equipped with minimal installation required. 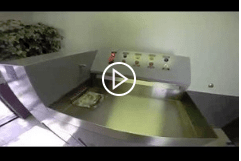 Our microprocessor controlled processing center continuously removes dust particles while the remains are sorted, processed and placed directly into the awaiting urn, drastically reducing the need for operator assistance. The BL 25M HD is our standard quality of Heavy Duty lift tables. 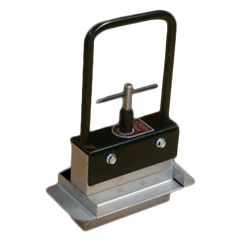 Fully equipped, this lift table comes with a 1/3 horse power motor designed for lifting loads up to a 1000 lbs with ease. Since fuel efficiency is a top priority for B&L, a digital weigh scale can be added for accurate body weight, in turn adding ease to the operator’s job. All the electronics are powered by a 12-volt battery mounted at the base. The top is lined with 6 alloy rollers with spring loaded pins for easy removal/exchange. There are 2 brakes located at the front and rear of the rollers and are controlled by using the red handle lever at the front of the lift table. The BL 30M is designed specifically for large cooler storage. Reaching a maximum height of 74.5″. Nothing is too tall for this lift table. 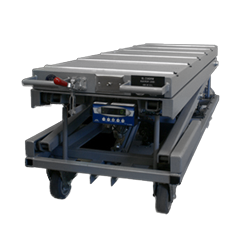 Fully equipped, this lift table comes with a 1/3 horse power motor designed for lifting loads between 100 lbs and 500 lbs with ease. Since fuel efficiency is a top priority for B&L, a digital weigh scale can be added for accurate body weight, in turn adding ease to the operator’s job. All the electronics are powered by a 12-volt battery mounted at the base. The top is lined with 6 alloy rollers with spring loaded pins for easy removal/exchange. There are 2 brakes located at the front and rear of the rollers and are controlled by using the red handle lever at the front of the lift table. The B&L Automatic loader is a custom built loading table to suit all B&L human model machines. The automatic control system plugs into the retort to facilitate a fully automatic loading process from a remote viewing room. It consists of a steel frame and rollers with a stainless steel outer casing. The control system is run by a programmable logic controller (PLC). 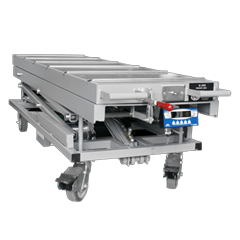 The autoloader can be set up to load multiple retorts or manual loading via a V groove track system. Features on the control panel are Start:for autoloading, Jog:to initiate rollers only and Stop:for emergency use. 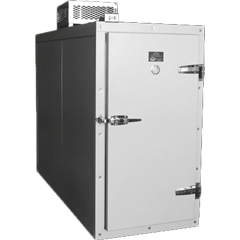 For the customer who wants a quality body cooler with no worries about on-site assembly, B&L Cremation Systems, Inc. provides a preassembled unit. Our Three Body Cooler is manufactured and assembled in the U.S.A. with 4” polyurethane foam instead of Styrofoam for a more energy efficient cooler. Complete with three roller shelves rated for 500 lbs. each. 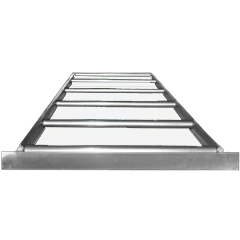 An evaporation tray that automatically dispenses and eliminates condensation for a worry and mess free operation. We ship the cooler completely assembled for off-loading and ready to plug in your standard 120 Volt / 10 Amp outlet. From a 6 Body Cooler to a 100 Body Cooler or more the sky is the limit when it comes to our walk-in body coolers. Our Walk-In Body Coolers are manufactured in the U.S.A. with 4” polyurethane foam instead of Styrofoam for a more energy efficient cooler. Our roller racks rated for 500 lbs. 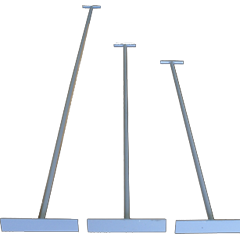 per shelf are available in three or four tiers and can be end loaded or side loaded depending on the configuration required. All panel to panel connections utilize the same tongue and groove lock system making assembling the coolers on site a breeze. 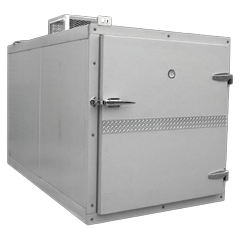 For the customer who wants a quality body cooler with no worries about on-site assembly, B&L Cremation Systems, Inc. provides a preassembled unit. Our Four Body Cooler is manufactured and assembled in the U.S.A. with 4” polyurethane foam instead of Styrofoam for a more energy efficient cooler. Our oversized cooler will enable you to store either two oversized bodies up to 1,000 lbs. on the bottom shelf and 500 lbs. on the top roller shelf. You can also utilized the roller shelves for four regular sized bodies or a combination of both. An evaporation tray that automatically dispenses and eliminates condensation for a worry and mess free operation. We ship the cooler completely assembled for off-loading and ready to plug in your standard 120 Volt / 10 Amp outlet. For the customer who wants a quality body cooler with no worries about on-site assembly, B&L Cremation Systems, Inc. provides a preassembled unit. Our One Body Cart Cooler is manufactured and assembled in the U.S.A. with 4” polyurethane foam instead of Styrofoam for a more energy efficient cooler. 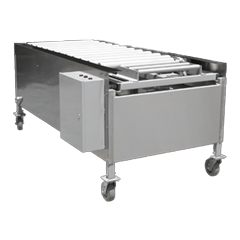 Our One Body Cart Cooler comes with no floor so you can roll a cart directly into the cooler. An evaporation tray that automatically dispenses and eliminates condensation for a worry and mess free operation. We ship the cooler completely assembled for off-loading and ready to plug in your standard 120 Volt / 10 Amp outlet. 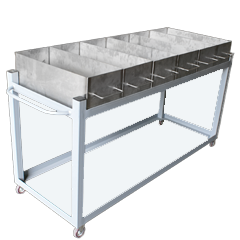 Roller shelving is provided with three body coolers and can be removed for cleaning or replacement. Individual rollers can also be removed. Our body tray is made from 18-gauge stainless steel and is 78 inches in length by 24 inches in width by 33 inches in depth. 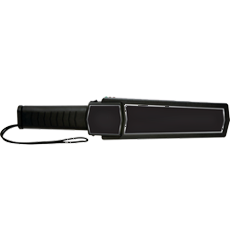 All of the edges are rolled for easy handling and it has a smooth professional finish. ½” Nylon bodyboard for easy body transfer with handles made in U.S.A. The air louver is a two foot by two foot motorized louver which replenishes ambient air back into the crematorium. 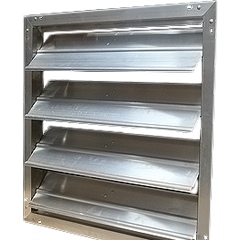 Capable of passing 2,500 cubic feet per minute of free air, the louver is located at or below burner height. The motorized damper can be interlocked with the controls of the retort. 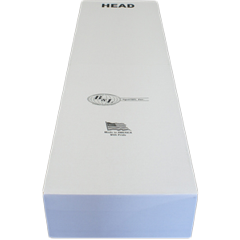 B&L Cremation Systems, Inc. cardboard cremation caskets come with a 450 pound test, double-wall, corrugated cardboard bottom coated with fluid resistant material to prevent leakage, and are fastened togther with a self-locking tie. A 200 pound corrugated top completes the casket. There is a minimum of ten per order. 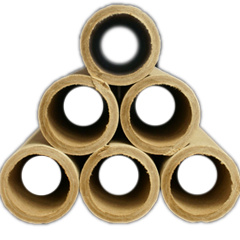 B&L Cremation Systems, Inc. offers the highest quality in cardboard loading rollers. Our rollers have a “heavy duty” side wall that is almost uncrushable when loading your retort. The overall length is 14 inches, long enough to load any cremation without excess waste. 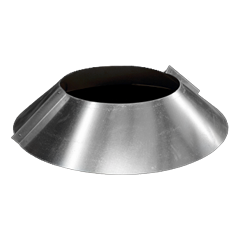 These rollers will extend the life of your refractory hearth by eliminating scraping and bumping of the casket during loading. They can also be used in mausoleum loading. Chart recorders help your crematory or incinerator record primary and secondary temperatures in the retort. Chart recorders are available in single and dual pen, depending on your state requirements. Replacement charts and pens are available from B&L Cremation Systems, Inc. Charts come in temperature, 24 hour, and seven day versions. 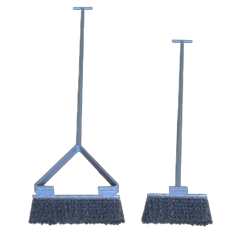 Our steel clean-out brush enables you to remove all of the cremated remains in your cremation chamber without damaging or scraping the hearth, therefore, extending your unit’s life. The steel bristled brush is removable, allowing you to change the size of the brush head or replace your old one when it is worn. Available in large (12 feet with a 12 inch head), medium (nine feet with a ten inch head), and small (five feet with a six inch head) sizes. They are also available in custom sizes. 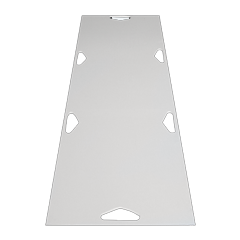 Our steel clean-out rake enables you to pull cremated remains to the front of the machine or side clean-out without damaging or scraping the hearth, therefore extending your unit’s life. Available in large (12 feet with a ten inch head), medium (nine feet with a ten inch head), and small (five feet with a ten inch head) sizes. They are also available in custom sizes. 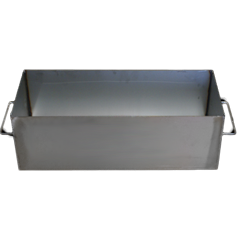 Made from 14-gauge stainless steel, our cremated remains collection pan is perfect for retrieving hot remains and organizing them after a cremation. It can be placed on our cremated remains cooling system for a quicker cool-down time, and also sorted through with our hand-trigger magnet for any metal remains. Sizes are 24 inches by ten inches by eight inches. 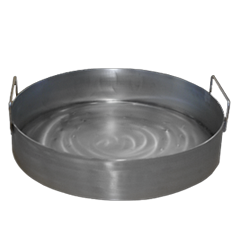 Custom cremated remains collection pans are available. This system comes ready-to-mount to a wall or any fixed structure. The system comes with tech screws for mounting to wood or steel. The fan on the bottom of the cooling system pushes air over the collection pan and cools the remains in just minutes for safe handling. The fan requires a 110 volt electrical outlet. 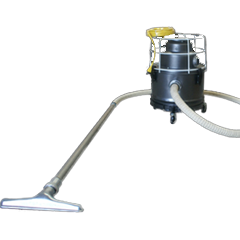 Our vacuum is a heavy-duty, high-powered vacuum used to clean up after cremations and keep your work area dust free. This vacuum also has a flame-resistant filter and a heat-resistant bag. The hand-trigger magnet is an essential part of your cremation tools. It is used to remove the metal parts from the cremated remains before processing. The magnet, when held over the remains, picks up the metal using a high-powered magnetic force. When held over a disposal container, the trigger is pulled away from the metal particles. As the force weakens, the metal drops into the container for disposal. 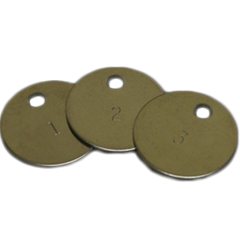 B&L Cremation Systems, Inc. ID discs can be customized with up to three separate lines of 12 characters, and a fourth line for up to five numbers. ID discs are made from 18-gauge stainless steel, with a 1.25 inch diameter. 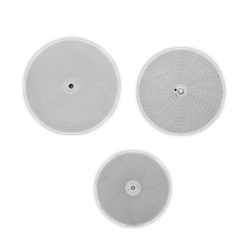 The discs will not flake, burn, or melt at temperatures under 2,600 degrees. The standard ID discs come in quantities of 100 to a pack. They are custom-made and sequentially numbered. 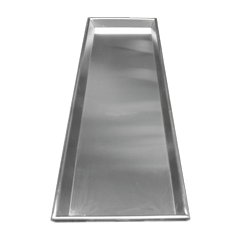 Made from ten-gauge stainless steel, our pan is reinforced with angle ribs to help prevent distortion due to the high heat of the cremation process. 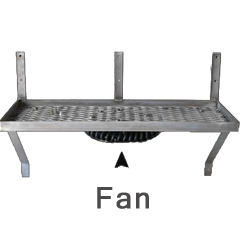 The sides of the tray prevent the remains from being scattered by the force of the burner. The multiple-remains collection table allows for multiple cremated remains trays to be collected for transpiration to the processing station. They are available in custom sizes. Eliminate your problems with B&L’s handheld pacemaker detector. It’s easy to use…just wave the wand over the container and if a pacemaker is present, you will get both an audible and lighted alarm. The roof thimble, like the storm collar, weather proofs the installation. 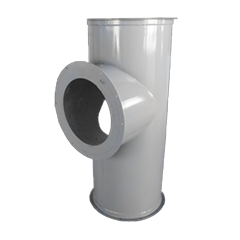 They are custom-built to suit roof pitch and stack diameter. It is available in 16-gauge galvanized steel. *For more information for availability for use, check local state requirements. Exhaust gases from the cremation process generally range from 500 degrees to 1,000 degrees. However, on occasion, due to large cases or a malfunction of the equipment, these temperatures can soar to over 2,000 degrees Farenheit. While some companies attempt to cool these gases with air, only a refractory lining of sufficient thickness and insulating capabilities will prevent a fire hazard. In a worst case scenario, our tests have shown that an unlined, stainless steel stack actually turns orange, even with air cooling, at 2,500 degrees Farenheit. This could result in a building fire. 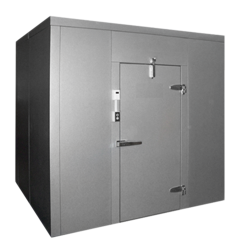 B&L Cremation Systems, Inc. provides a three inch, 2,500 degrees Farenheit insulating liner with a ten year warranty to safeguard your facility. Our lined stacks, at an exhaust temperature of 2,000 degrees Farenheit, have an outside wall temperature of approximately 400 degrees Farenheit, well below the ignition temperature of wood (the typical roof construction material). Storm collars dispense rain. They are mounted on the roof where the crematory stack comes out. 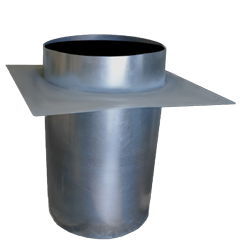 The storm collar weather proofs the installation, while allowing hot air associated with the exhaust stacks to escape to the outside. 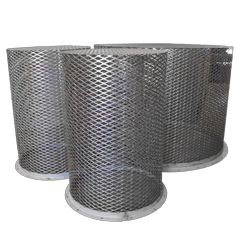 They are available in galvanized or stainless steel, made-to-order, to fit any stack diameter. The storm collar is a two-piece item and easy to install and secure. A high-temperature sealant is required for water proofing.